Hope all our readers had a fun/relaxed bank holiday weekend and are well rested as it is looking set to be a busy week here in London with some fantastic shows opening on Thursday 8 April. First up is "Lyrics and type - Verse 2" an international typographic screenprint exhibition from the creator of the award winning Australian arts culture publication WOODEN TOY QUARTERLY with support from the good folks at VNA MAGAZINE here in London. Following on from the success of the LYRICS AND TYPE: VERSE 1 zine project at Gorker Gallery (Oct 2009), comes the exciting second instalment in the series of LYRICS AND TYPE projects at London's East Gallery on Brick Lane. 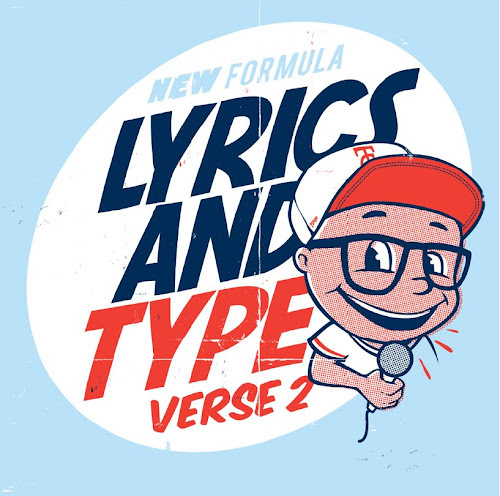 Combined with an all new formula and a ‘bass dropping’ array of artists, LYRICS AND TYPE: VERSE 2 aims to feature interpretations of both famous, past and present song lyrics by 16 leading international typographers, designers, artists and illustrators. Each of the 16 selected artists have been carefully invited by Wooden Toy and VNA Magazine to respond to a project brief and discuss with the public through it’s exhibition on the importance of music ‘versus’ influence and personal inspiration. The show opens this week, 8 April and features a fantastic line-up including Eine, I Love Dust, Numskull and Mr. Gauky to name a few.